Setting a Thanksgiving table shouldn't be harder than cooking than meal! Be inspired by these uniquely beautiful ideas for centerpieces and table settings that can be tailored to suit any style and any budget. There’s definitely something to be said for natural beauty. This table layers the simplest of elements and textures for a look that’s, well, simply beautiful. 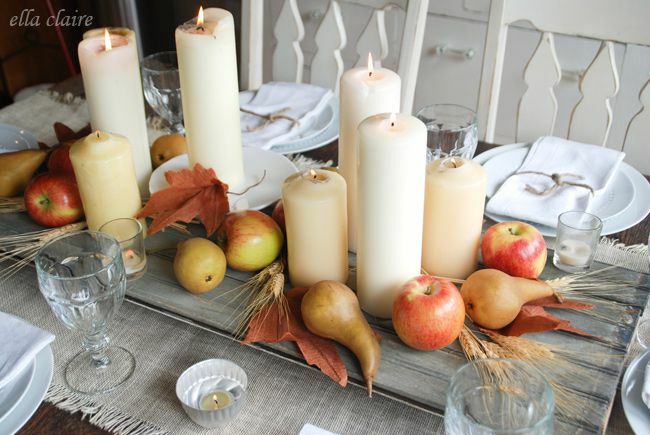 Pillar candles are surrounded by pears, apples, and fall leaves and white place settings are tied with humble string. You can shop for most of this tablescape at the grocery store! One doesn’t always think of the ocean when it comes to Thanksgiving, but this tablescape perfectly blends fall elements—like pumpkins, burlap, acorns and antlers—with coastal elements such as tiny starfish, shells, and a color palette that evokes the sea. This table has a rustic yet refined feel. Antlers, a neutral color palette, and small white pumpkins combine with dramatic topiaries and a surprising element: square chargers. It’s amazing how gold spray paint transforms objects. Here, pumpkins and pine cones are given the Midas touch and displayed on a burlap runner along with gold berry vines and votive candle holders for a Thanksgiving table that really shines. This is great idea for a Thanksgiving table shared with children. There’s no need to worry about spills with this kraft paper tablecloth, and kids can even draw on it! Sweet striped napkins and mini pumpkins complete this kid-friendly look. Here are some more fun looks for the kids' table. Plaid is always a fall favorite. Here, two plaid throws are folded and used as table runners under a grouping of natural elements, such as pumpkins, wood slices and leafy boughs. This cozy look is perfect for a mountain retreat or a cabin in the woods. A farmhouse look is achieved on this Thanksgiving table through the use of casual country favorites such as sunflowers, white enamel, and bandanas used as napkins, proving that your table doesn’t have to be formal to be beautiful. Color takes center stage on this table, with bright turquoise linens and blue mason jars complementing the orange pumpkins and berries, making them really pop. Layers of great texture on the chargers and in the runner that’s gathered down the center make the table feel more sumptuous. This Thanksgiving table derives its beauty from the tone-on-tone neutrals layered one on top of another, from the wooden candle holders, to the woven chargers, to the show-stopping wheat stalk centerpiece. This Thanksgiving table has a preppy look, thanks to the striped table runner and bright yellow napkins folded like bow ties. Blue mason jars filled with grocery store bouquets couple with mini pumpkins for a centerpiece that is effortless yet effective. Many of us only have white dishes in the cupboard, but that’s all you need to create this beautiful table that works for any fall occasion. A runner down the center is topped with white pumpkins and candle holders, along with a trio of grocery store bouquets that provide the only color on the table. Who says Thanksgiving tables have to have pumpkins on them? This table is filled with modern, organic elements such as geometric shapes and patterns, trendy air plants, and even typographic place settings that evoke the sentiment of the holiday. This modern, glam look is a non-traditional, yet memorable way to dress the Thanksgiving table. Deep purple linens feel rich and decadent and just happen to look great with glasses of red wine. The gold chargers and starburst napkin holders lend some bling, while the calla lilies are an unexpected but lovely choice for a centerpiece.